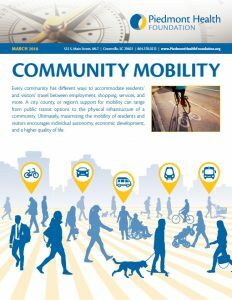 Posted in Transportation & MobilityTagged built environment, mobility, public transitLeave a Comment on How do we support community mobility? Readers of the Greenville News on Sunday, March 25th saw the front page headline: Transit Transition: Change May Come to Greenville. The article by Eric Connor explored why businesses and politicians are now on board to help Greenville passengers. The online edition included a video by Lauren Petracca (embedded above) following a Greenlink rider through her day. Her story is heart-wrenching and familiar to those in health care, education, and social service agencies – one of pinching pennies, walking miles instead of paying a friend $25 for rides, and carefully planning the day around bus trips. She has long known that Greenlink needs improvement and is desperate to see change. But these days, in a booming economy and tight labor market, business leaders are demanding a better transit system, too. They need employees on whom they can depend for the second and third shift. They want access to workers even if their business are located off the current bus routes. They want to see congestion reduced and parking alternatives created for their employees. With a growing awareness of disparity of opportunity in Greenville County, new voices are calling for change. And with increasing congestion and new ridership markets, some residents are making the switch to transit by choice. This demand may very well create a “transit transition” in Greenville County. Piedmont Health Foundation is proud to have been a partner to Greenlink since 2015, when we called for the completion of a Comprehensive Operational Analysis and a Transit Development Plan (both of which we helped fund). Greenlink’s staff have made significant changes and have proven the system is efficient, ready for innovation, and worthy of investment. Lend your voice to the movement. Check out this tidy and helpful summary of the facts to date. Stay tuned here for local news related to transit and upcoming activities of our elected officials related to improving mobility for all.